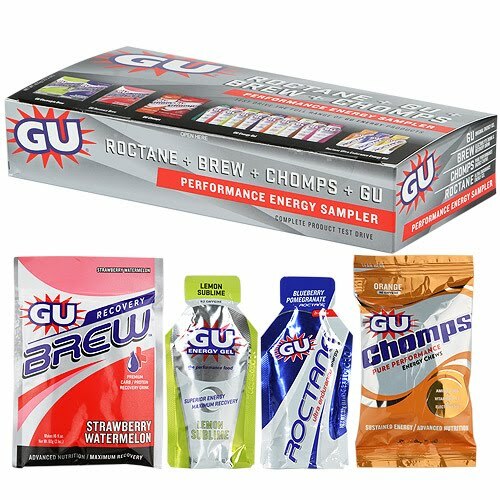 Giveaway: GU Performance Energy Sampler! ***Read my review for these products here! The giveaway will be for one box of GU Performance Energy Sampler! A $23.99 value! The giveaway is open until Midnight on Saturday September 11th. Winner will be chosen on Sunday September 12th using Random.org. Check out the GU Energy website and let me know what flavor GU you would love to try! -Tell me what you would use these energy products for (1 entry). I'd use these for when I start running! i would use these products on my long runs for refueling. my water bottle has a little pocket on it for fuel storage! I found your site through PBFingers! found you on the GU Facebook page. I'd use these for jogging! I would love to try the Mandarin Orange Flavor! I would use these energy products for me. I am in the military, and I work out a lot, so these would be great! I found your site through GS, but I have been following it ever since! Love to try the comps. I'm most interested in the recover brew. Currently my runs are only 4-6 miles, so don't see the need to eat anything while I'm running but a recovery item would be great. I'd like to try the tri-berry to start with sounds good. I have a lot of giveaways on my blog come visit & enter to win. I would love to try vanilla bean. I'd like to try the Blueberry Pomegranate Electrolyte Brew! blueberry pomegranate all the way! Hi, I'd like to try the Mint Chocolate. I'd use these energy products right before exercising in the morning. The mint chocolate sounds good. I would use these after my weekly run. Found this site and giveaway on ten talents blog. I'd use these to "get up and go" and most likely clean house or take the kids to the park and play with them. I would use these before I fitness walk. I entered Frito Lay giveaway. I found your site on another blog, but I don't remember which one.